​Click here to see the object with more of the surrounding sky. 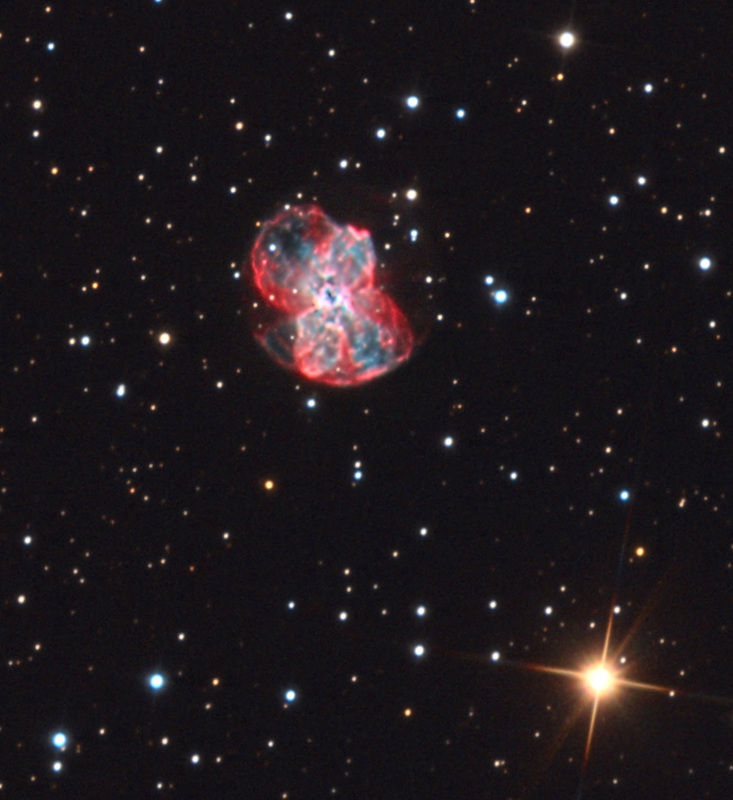 Recently I completed processing this image of the famous planetary nebula NGC 2440. I worked on this object long ago (2003) using a 0.5m RCOS telescope at Kitt Peak. By today's standards the "normal" total exposure back then was easily 1/10th of what is typically done today. In addition new processing algorithms and techniques permit dramatically different kinds of presentations than what was done 10-15 years ago. These two things taken together- longer exposure times and effective non-linear treatment of bright objects (like NGC 2440) *strikingly revealed* something about this object that never "popped out" visually to me before. Specifically in this case I did a number of processing things for this data. First I upsampled the image by 2 in order to better see the small structures and deconvolve them with a bit more control. It is better to upsample, deconvolve, and then downsample if necessary- than it is to deconvolve and then upsample to make a larger picture. Keep in mind- this isn't drizzling the data. The data I was working with was already oversampled. In addition I applied strong non-linear adjustments in Pixinsight including HDRMT on the (synthetic) luminance of the image and ArcSinhStretch and Masked Stretch on the RGB components. This resulted in the image below. After staring at it for a few moments I noticed the faint circular halo (which I had not seen before). This was simply the result of the long exposure time. In addition the inner structure clearly took the form of a bi-polar outflow! When this nebula is displayed with its natural brightness profile this structure is very hard to see- but by applying the non-linear adjustments the pattern recognition part of my mind was instantly struck by the shape. I thought this has to be something interesting. 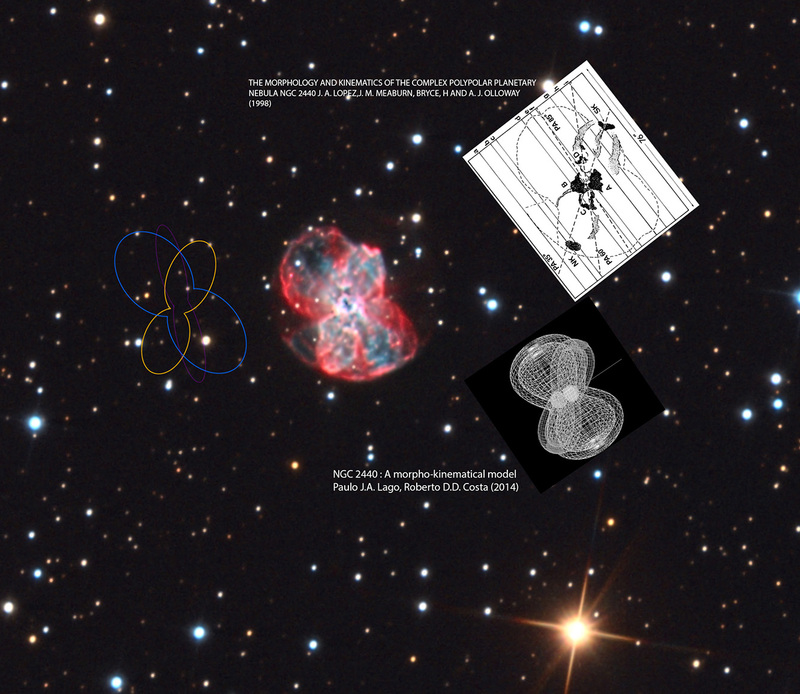 Sure enough in a few moments I found papers by professional astronomers who noted the same thing and quantified the structures by measuring (spectroscopically) the velocities of the gas in different parts of the nebula and modeled the result. The image below notes three outflows as can be seen by my ouline on the left. It is the hour-glass shape in yellow-orange that first captured my attention. I just had never noticed it- not even in HST images. But it is very clear in this kind of representation! The paper from 1998 appears to be the first reference to these outflows. It is likely these bi-polar flows are caused by a system of binary stars and the episodic events change in their axial orientation as the pair rotates. 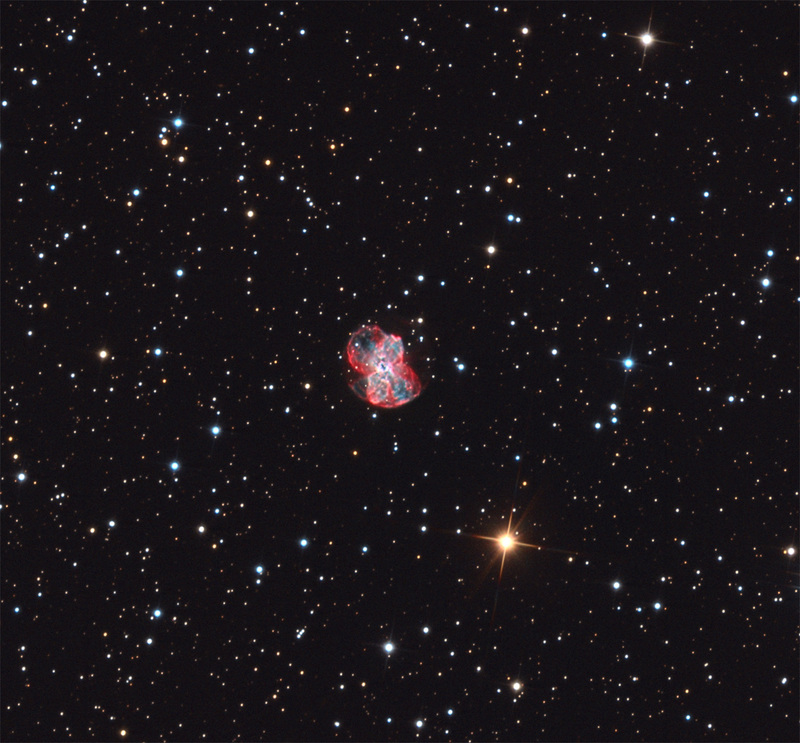 Later in 2014 other astronomers wrote a paper that models the likely 3-dimensional shape of NGC 2440. The delightful aside I had when working on this image all came about with new tools and techniques. So next time you are working on your own data- be certain to have a critical eye for what is there and perhaps revealed by different processing choices- the discovery is great fun.